In Choice and Federalism: Defining the Federal Role in Education, the Koret Task Force on K–12 Education recommends that Washington limit its education role to what it can do best: encouraging states to create level playing fields that expand school options and competition, along with access to accurate information on school performance, to generate the greatest opportunity for students and their families to make well-informed decisions about where to enroll. Is School Competition a Free-for-all? What is the Role of Individual States? In 1930, the federal government paid for less than 0.5 percent of the costs of public education in the United States; by 2000, the federal government’s contribution had risen to more than 7 percent, with virtually all the rest coming from state and local government sources. This is a nearly twentyfold increase in government spending in what had traditionally been a locally funded enterprise. Although still a relatively minor financial player in the provision of public education, with the No Child Left Behind legislation and the much earlier Elementary and Secondary Education Act, the feds now play a much larger role both in K–12 education policy and in monitoring performance–often with unfunded federal mandates. Sadly, the federal government’s increased role in education has led to only small improvements in performance by American students. Under such circumstances, particularly in these trying economic times, every dollar of federal expenditures is coming under scrutiny, and education costs and performance should be part of that analysis. In this report, Choice and Federalism, the task force recommends moving away from the top-down approach and fully embracing policies (which may mean abandoning some old practices) that promote parental choice of all hues. All eleven task force members engaged fully in this project, although one member (Eric Hanushek) did not agree with all recommendations. In addition to the task force, a number of people assisted with this project and are owed a debt of gratitude: Denise Elson, Jacqueline Jones, Ellen Santiago, Richard Sousa, Terry Su, Tin Tin Wisniewski, and Ann Wood. Washington is at crossroads on K-12 education policy. It has three options: 1. continue down the path of top-down accountability; 2. devolve power to states and districts, thereby returning to the status quo of the mid-nineties; or 3. rethink the fundamentals and do something different by empowering parental choice. A choice is imminent because of the need to reauthorize the Elementary and Secondary Education Act (ESEA). The top-down approach aspires to emulate the national standards, accountability, curriculum, and teacher preparation policies dictated by the centralized ministries of education in most developed nations. The arguments for the top-down approach in the United States include the consistency and coherence that can flow from a centrally controlled system, as well as the ability of the federal government to counteract some of the forces that support the status quo in education at state and local levels. Thus in the top-down model the federal government becomes an agent of reform and a provider of quality standards that serve the nation’s interests better than the haphazard and often self-serving ministrations of fifteen thousand individual school districts and fifty states. The top-down model experienced substantial growth during the Clinton and Bush administrations. That growth has continued under the Obama administration but has shifted from legislatively crafted control (e.g., No Child Left Behind [NCLB]) to executive branch control (e.g., Race to the Top and NCLB waivers). The shift toward greater federal control, although significant in the context of US history, falls far short of the degree of central management exercised by most foreign ministries of education. Because governmental authority over schools is legally dispersed among federal, state, and local entities in the United States and will remain so, even the most enthusiastic proponents of the top-down approach understand that Washington will never have the authority or control over education that is exercised by the governments of New Zealand, Finland, Singapore, and so on. Thus the putative advantages of the top-down approach are unlikely to be fully realized in the United States because the approach cannot be fully implemented. Consistent with that view, we will subsequently present evidence suggesting that the substantially heightened federal role in education of the last ten-plus years has had only modest impact in some areas of student achievement, far short of what had been hoped. It might be that further centralization would yield more benefits, but it is doubtful that more federal control is politically possible and in any case its additional yield is uncertain. The second path—devolving recently accumulated federal power to the states—is much favored by those who represent the historical structures for delivering K-12 public education, dominated by local school districts, as well as those who favor states rights in general. This is manifest in reauthorization proposals for the ESEA that allow each state to establish its own accountability system and that require teeth only for the very lowest performing schools. It is unclear to us how releasing states and school districts from federal accountability and granting them maximum flexibility is anything more than a return to the status quo. It is the regrettable state of the status quo that motivated increased federal involvement in the first place. With a quarter of America’s youth not graduating with a regular high school degree, with those students who remain in school performing at mediocre academic levels compared with students in many of the nations with which we compete, and with the costs of our public education system among the highest in the world, we believe that something is needed other than a return to the happy days of school governance in the last century. Given a choice between the dismal records of control of public schooling by local public school monopolies versus an evolved form of No Child Left Behind that retains teeth, we favor the latter. But there is a third and better way, an approach founded on two principles that have served the nation exceedingly well for our entire history: federalism and choice. The federal structure of our government offers an opportunity to specify the role of Washington strategically, to leverage what it clearly can do best, while allocating to states and locales what they are best suited to do. This may sound like familiar territory, but, for all the rhetoric about local control, states rights, and the like in public education, the rhetoric has not treated federalism thoughtfully. The Koret Task Force view of federalism is disciplined by the laws of economics and empirical experience on how federalism works best—a perspective known as fiscal federalism. Our second organizing principle is choice. Much has been written and studied in this area—charters, vouchers, within-district choice among traditional public schools, and much more—but the idea of choice, so powerful in our economy and other government enterprises including higher education, has rarely been examined in the context of federalism and the appropriate roles of Washington and lower levels of government. One great virtue of a “competitive” system—a choice system offering lots of alternatives—is that, even if no schools actually respond to the competition, the schools that are providing a higher quality education will still have an advantage, the bad schools will lose students and money, and students will have options that prevent them from being trapped in schools that are not serving them. Our analysis provides fresh insight by integrating federalism and choice as the driving principles of change. Fiscal federalism argues that services are most efficiently delivered if provided closest to the taxpayers/consumers receiving them and that competition among local governments for residents/taxpayers will improve those services. We also know that education is a service that can be undermined by excessive scale or at least by highly bureaucratized top-down control. Local control means that programs and people can be much more easily chosen and deployed based on professional judgment rather than on formal rules set in Washington or even state capitals. But local control in the sense of parental and taxpayer influence is undermined in the current system by special interests that control school bureaucracies. The present arrangement of school boards, federal and state regulations, union contracts, teacher licensing, and court orders is frozen in place and thus can resist or distort almost any new initiative. Further, the ability of taxpaying parents of school-aged children to vote with their feet (leave school districts with which they are dissatisfied) is severely constrained for low-income populations that are most likely to find themselves served by low-performing schools. This lack of geographical mobility for large segments of the population undermines the competitive pressure that low-performing schools and school districts would otherwise expect to face in the context of fiscal federalism. Vibrant, open competition among the providers of education services for students and the funds that accompany them must go hand in glove with federalism if our alternative proposal is to work. The absence of choice is why the ESEA state waiver actions taken by the Obama administration and offered in ESEA reauthorization proposals are not consistent with our proposal. Simply devolving education authority from the federal government to the states through a waiver mechanism or legislation puts us back under the governance model that motivated increased federal involvement in the first place. If states and localities are not disciplined by a strong top-down accountability regime, they must be disciplined by something else or they will fall back into old habits. That something else in our proposal is choice, that is, the ability of parents, armed with good information on school performance, to decide where they send their children to school. For the vast majority of families with school-aged children, residential address determines the public school those children attend. The school district assigns the child to a school, typically the one closest to the family’s residence. This assignment policy has a strong effect on parents who want the best schooling possible: a quarter of parents of school-aged children report that they moved to their current neighborhood for the school. Another 11 percent of families choose to pay for their children to attend private schools. Charter schools and homeschooling account together for another 6 percent. Fifteen percent of school-aged children attend parent-selected public schools (i.e., schools to which the parents apply for their child’s enrollment). Thus more than 50 percent of parents of school-aged children have engaged in some form of school choice, albeit primarily in the form of residential choice and private school tuition: two socially inequitable means of determining where a child attends school. There is little doubt, based on the long waiting lists for popular public schools of choice, that many more parents wish to exercise choice than are currently able to do so. That poor families are least likely to be able to exercise choice means that the school districts that serve those families are least subject to competitive pressure and least likely to change. Extending school choice to every parent is central to our plan and critical to the success of any effort to replace top-down accountability with local control. Further, that choice must be informed. Parents need reliable information on performance when choosing a school. In our view assuring that parents have ready access to reliable information on the performance of schools is a federal function, one that in the frame of fiscal federalism is unlikely to be taken on, much less carried out well by lower levels of government. Student-based funding is critical to our package of recommendations. Funding must follow students and be weighted to compensate for the extra costs associated with high- need students if schools are to compete for students and if parents are to be able to have a real choice. We recommend student-weighted distribution of ESEA, Individuals with Disabilities Education Act (IDEA), and Head Start funds. With respect to ESEA, we recognize that federal funds alone may not be enough of an incentive to change school admission preferences. Thus we recommend that states that pursue a choice approach using student-based funding with federal dollars be required to similarly distribute their own compensatory education funds. Because states vary substantially in how they target and describe state-appropriated funds intended to support local school districts, it would be wise for Washington to set a proportional floor under such funding (e.g., no less than 50 percent of the state’s appropriation for K-12 education would be allocated to student-based funding). Thus, if a student in a particular district spending $12K per student annually had $4K of federal and state funds allocated to his or her education under a weighted-student-funding formula, any accredited school in which the child was enrolled would receive the $4K, be it a virtual school, a regular public school in another district, a charter school, a private school, a school outside the student’s neighborhood in the same district, or the neighborhood public school. It might seem that $4K would be an insufficient to create a competitive market if the typical per pupil expenditure were $12K. But it is likely to be more than sufficient if both the federal and state student-based funding were accompanied by the requirement that districts be blind to the federal and state student-based supplement when distributing their own tax funds to schools. Consider two elementary schools, each serving five hundred students, with the first school serving 25 percent high-need students and the second serving 75 percent high-need students. In a district spending an average of $12K per student and subject to student-based distribution of federal and state funds, the second school would have an annual budget of $6.5 million whereas the first school’s budget would be $5.5 million. We believe a difference of a million dollars at the two schools and the addition of $4K for every high-need student who chooses to attend one of the schools is enough to create a vibrant market for school choice within districts. The situation is different for interdistrict or private school choice. There $4K of federal/state funding attached to the student would leave a gap in tuition. If parents had to pay the difference it would limit choice for the poorest families, but it would make tuition in better schools affordable for large numbers of families for whom that option is presently out of reach. The tuition gap could be eliminated or reduced through tax-credit scholarship programs or personal tax credits and deductions. States could take the next step, as some already have, and incentivize districts both to make their own student funding portable and to accept out-of-district students. We lay out a detailed set of recommendations for federal action in the body of this report. The most important are highlighted here. Each of these recommendations is envisioned in a federal legislative context in which states can either choose to pursue a choice-based reform strategy or stick with a top-down federal role that is some variant of the current system. We recommend that the ESEA funding formula be overhauled to award grants to high-need students choosing to attend any accredited and authorized school and that participating states be required to allocate their own need-based funds similarly. Consistent with our proposal for ESEA funding, we also recommend that IDEA funding and Head Start funding be student-based (according to the disability for IDEA and by poverty level for Head Start). IDEA funding would be limited to those disabilities that are associated with substantial extra educational expenses and readily recognized. We further recommend that the funding formula take into account local and state differences in the cost of services. We recommend that ESEA’s testing and accountability provisions be abolished for states that adopt the choice-based approach. To opt out of federally controlled standards and accountability, states would be required to establish or oversee choice portals that provide clear and relevant information to parents on school performance, including the performance of students on standardized and normed assessments that are aligned to the curriculum used by particular schools. Such assessments could differ within and across states but in all cases would allow a determination of changes in performance of students enrolled in a school against national or state norms (e.g., students entered third grade in the Lincoln Charter School at the 45th percentile on math and ended third grade at the 52nd percentile). Assessment results would continue to be disaggregated by student group. States, districts, and schools could, of course, choose to implement common standards and assessments that are widely deployed in other states, but they would not be forced to do so. We recommend that states that pursue the choice approach be required to establish unified student admission systems that provide students and their parents with the opportunity to compare schools and complete enrollment applications for any accredited school that accepts students supported with state and federal student-based funding. The federal government would use its expertise in gathering and providing information on school quality to devise requirements whereby each state would inform parents of essential indicators, one of which would be achievement. In addition to providing relevant information on school performance on which to base choice, the choice portals would coordinate parent and student choice of school through processes that maximize the match between parental and student preferences and that ensure equity of access. We recommend that states be required to establish a system for authorizing charter schools that allows the charter school sector to engage in orderly expansion to meet demand; provide funding under the same formula that applies to all other publicly supported schools; and provide charter schools with access to capital funds through a mechanism equitable with district funding. About 20 percent of the states do not provide for charter schools at all, and many of the rest impose caps on the number of charter schools, place the authority to authorize and oversee them in the hands of the traditional school districts with which they compete, shortchange them on per-pupil funding, and require them to cover the costs of acquiring school buildings out of their operating budgets. The other forms of schooling we have recommended to expand parental choice (interdistrict choice, open enrollment within traditional school districts, private schools, and virtual schools) have an important role to play, but all except virtual schools typically require that students travel much further to school than they would if they attended a traditional public school. Thus even if these forms of schooling were in good supply, which they are not, they would be functionally unavailable to many students whose parents would like an alternative to the assigned school. A vibrant charter school sector that is free of regulatory barriers to growth is the best present answer to the short supply of schools of choice for large numbers of students. We recommend that the teacher quality requirements of ESEA be abolished for states pursuing the choice approach. Under our reform proposal, schools will be operating in a highly competitive environment in which school performance is important to success and in which teacher quality is a dominant factor in achieving high performance. In this scenario, the federal government should have no more role in setting the standards for the training, employment, evaluation, compensation, and advancement of teachers than it does for restaurant chefs. This is a state responsibility, and states should be able to devolve much of their responsibility for teacher quality to individual schools and school districts in a system that holds schools accountable for their performance. In doing so, many of the state “barriers to trade” in the form of teacher certification laws that heavily advantage people who have matriculated in schools of education within state institutions of higher education would fall. We recommend that the Obama administration’s signature education initiatives, Race to the Top, School Improvement Grants, Investing in Innovation Fund, Effective Teachers and Leaders, the ESEA waiver competition, and any other federal programs that involve the federal regulation of the content and mode of delivery of education or the organization and staffing of schools be null and void for states pursuing choice-based reform. In our model of fiscal federalism and choice, the federal government has four core responsibilities in education: redistributive cash transfers, providing information on school performance and what works, enforcing civil rights, and enhancing competition among education providers. None of Obama administration’s key education initiatives serves these functions and thus none would be appropriate within our model. The reasons our proposal should be attractive to states are fourfold: serving the needs of their citizens by expanding educational choice and opportunity; creating conditions under which innovation around productivity is incentivized, leading to lower overall taxpayer costs for education; greater flexibility and freedom from federal control at the state level in education policy and management; and assured higher levels of per student funding than would be the case if appreciable portions of federal funding had to be garnered through competitions (e.g., Race to the Top). We recommend that the choice approach be an option for states. We envision a world in which some states stay under federal accountability control and some are able to opt out and embrace a more competitive system in which the federal role is very different. We believe that top-down federal accountability (i.e., some evolution of NCLB) is necessary in the context of our current system of dispersed authority but that it is not necessary (except for information reporting) for a truly competitive system in which parents can choose their schools, schools have incentives to perform, and schools are held accountable from the bottom up. We realize that the appeal of our proposal will vary across states, and we believe that states should have the right to decide how to proceed on such a fundamental and important area of policy. A state option would allow the states most interested in choice-based reform to pursue that option, whereas other states could stick with some version of the evolving status quo. Comparisons of student progress in states opting into choice-based reform versus those remaining with the current arrangements would allow Congress to evaluate the reform as implemented in pilot states and use that information in deciding whether to expand the program. The United States has a choice—continue down a path of increased federal control of education; return to a pattern of school governance in which local public school monopolies decide how children are to be educated and only the affluent have choice; or embrace a new approach that is grounded in proven and time-honored principles, asking the federal government to only do what it does best, and asking our local school districts to do what they have always been counted on to do—provide education—but as strong competitors for students, not as protected monopolists. Most countries whose students achieve at higher levels than students in the United States have national education ministries, but so also do most countries that perform at lower levels than the United States. We have previously put forward recommendations for improving NCLB: John E. Chubb (2009), Learning from No Child Left Behind: How and Why the Nation’s Most Important but Controversial Education Law Should Be Renewed. Stanford, CA: Education Next Books. It is well-documented that reimbursement systems for identified disabilities tend to yield overidentification of special education students. Most of this problem is clustered within categories of mild disabilities that are difficult to diagnose reliably (e.g., learning disability, attention deficits). Coverage of this issue is beyond the scope of the present document, but our proposal for student-based IDEA funding is in the context of a funding system that covers only expensive and easily identified disabilities (e.g., autism, mental retardation). Although the federal government has been involved in K-12 education since the beginning of the republic, its role until recently has been largely confined to providing financial resources and information to states and local education agencies. Federal undertakings escalated substantially with the 1994 and 2001 reauthorizations of the Elementary and Secondary Education Act (ESEA) and with the American Recovery and Reinvestment Act of 2009 (ARRA). Under those statutes, Washington’s funding was made contingent on compliance with detailed requirements for how to deliver education, including the qualifications of teachers, standards for what students should learn, the curriculum for reading, the nature and timing of student assessments, public reporting requirements on school performance, and accountability for schools and districts failing to meet federal targets for improvement. The ESEA is now being considered for reauthorization, which has been due since 2007. The concerns about the state of public education that drove much of increased federal involvement in the previous two reauthorizations and the ARRA have not abated. Few issues are more important for the nation than the education of its citizens, which may be substantially affected by the ESEA reauthorization. This report makes recommendations for ESEA reauthorization and other federal education programs based on fresh considerations of how federal involvement can best contribute to growth in educational opportunity. It aims to change the federal course dramatically to contain costs and raise student achievement. And although we focus on ESEA reauthorization because it is on the horizon as an action-forcing event, our redefinition of the federal K-12 role goes well beyond the specific confines of ESEA. We identify three general approaches to the federal role in education that could undergird reauthorization. One is to continue the catchall, infinitely expandable, increasingly costly, and ineffective approach that the federal government has lately fallen into, with the hope of more success down the line based on better policy prescriptions and refinements of law and implementation. The second is devolve federal control to the states and local school districts, thereby returning to the status quo of the mid-1990s. The third is to change course dramatically to an approach that has coherent principles, definable limits, containable costs, and the possibility of boosting student achievement. We are putting forward such a coherent approach. Although taking into account political and historical realities, as well as evidence on the present functioning of various federal education programs, the foundation of our approach is a combination of fiscal federalism and choice, with choice exercised through information-rich competitive markets. These models have long and separate histories as ways of thinking about how government can most effectively enhance the delivery of essential services. We combine them to offer a new path forward. Fiscal federalism holds that the federal system provides policy makers the opportunity to allocate responsibilities among levels of government in ways that promote efficiency and equity. In essence, policy makers should allocate decisions to the unit of government closest to the consumers of the service, unless there are externalities—spillovers—that prevent the local unit from making such decisions. In most matters, schools should make better decisions than districts, just as school districts should make better decisions about educational services than states, and states better than the federal government because those services are consumed locally. There are, however, a number of externalities in education. That is to say, education doesn't just affect the student. For example, the increased education of individuals spills over to the benefit of those around them and the rest of society. Because school districts vary so widely in the tax base from which revenues for schools can be generated, higher levels of government are better positioned to address the funding issues surrounding such externalities than are local school districts, much less individual schools. Otherwise, either poorer districts will spend less for education, with the possibility of lower school performance, or they will raise their tax rates to disproportionate levels, causing mobile tax payers to flee. Both taxpayer flight and inferior education outcomes are externalities in public education that states and the federal government are best positioned to address. Of course, funding levels are only one determinant of educational outcomes, with adequate levels being necessary but far from sufficient to assure that the negative externalities associated with the undereducation of individuals are minimized and the public good associated with effective education is magnified. There is a national interest—including a powerful economic interest—in a well-educated population. 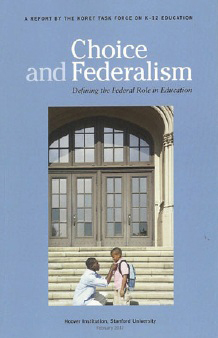 From the perspective of fiscal federalism, the design challenge for the federal role in education in general and the reauthorization of the ESEA in particular is to identify the major negative externalities facing local providers of educational services, determine which can be best addressed by state government, and assign the remainder to Washington. We carry out that exercise in this report, and it yields a very different picture of federal involvement than is seen at present or that will be seen in the future if Washington continues down its present path. For example, in our model, Title I of the ESEA, which concerns education of the disadvantaged, becomes strictly a mechanism for cash transfers to support the schooling of high-need students rather than 181 pages of legislative prescriptions and thousands of pages of associated regulations covering requirements for everything from parental involvement to school libraries. Fiscal federalism takes us far in rethinking the federal role in education, but it has a significant limitation: it lacks a strong competitive mechanism. Within the management structures for public schooling that have developed in the United States, the precepts of fiscal federalism lead to more decentralization but still within a hierarchical arrangement of monopolistic responsibilities. A redesign of federal responsibilities for education under fiscal federalism would reassign many tasks that have recently shifted to Washington back to the states and local school districts (i.e., further down in the hierarchy). But the final resting place in that hierarchy, the local school district, would remain a monopolistic locus of control, one that cannot be avoided by those who are geographically immobile or unable to afford private schooling. As bureaucratic monopolies, local school districts cannot be counted on to use their funds in ways that are responsive to taxpayers or consumers. Instead, they respond to the interests of whoever is powerful at the local level, more often than not organizations that represent teachers employed by the school districts and thus having the greatest influence on the election of school board members. School boards, in turn, appoint and oversee the administrators who run the schools. This system is likely to be much more responsive to the needs and wishes of adults who are employed in schools than to the needs and wishes of those—children, taxpayers, communities—served by those schools. Bad decisions get made routinely on behalf of those vested interests. Charles Tiebout’s 1956 article, “A Pure Theory of Local Expenditures,” and a substantial body of subsequent empirical research demonstrate the strength of one alternative to the political process for determining the nature of local public services. People “vote with their feet” (choosing from among the many local jurisdictions in which to live in most metropolitan areas) rather than involving themselves in the political process to improve local services. Thus instead of selecting a residence and then trying to elect a school board that will provide the quality of schooling they desire for their children, parents will move to the school district that they feel best provides what they want at a price they are able and willing to pay. The proliferation of smaller suburban school districts surrounding most metropolitan areas allows this sorting to occur readily. This option is much more readily available to the affluent than the poor, who remain concentrated in large cities. Those large cities, unlike smaller suburban governments, cannot tailor their services so that average taxpayers get back the services they want and pay for in taxes because doing so would mean providing a different level of services to affluent than to poor sections of the municipality. Thus large cities redistribute taxes from richer to poorer residents, causing richer residents to flee. In essence, the larger and more diverse a city’s population, the less efficiently it is able to match service provision to taxpayer contributions and perceived needs. This buffers urban school districts from dissatisfied parents because they can flee and do so; those who remain are both immobile and politically weak in the context of the control of public education. One way to correct the strong tendency of local school bureaucracies to cater more to adult than student interests is to regulate and intervene from above—the course of action taken by Washington during the last fifteen years. We argue that this has been only weakly effective and has imposed a heavy regulatory burden on schools in the form of administrative costs and inflexibility. We propose, instead, to create real competition among the providers of K-12 education services for students and the public funding that accompanies them. Competition among a diverse set of education providers (public, private, charter, virtual, local, and distant) is very different from the competition among local municipalities for residents and taxpayers that is the competitive mechanism in fiscal federalism. Competition among education providers allows parents to obtain their children’s education from an education provider that could be around the corner. They do not have to move to another school district. Our position is that competition for students and the public funds associated with them, if accompanied by providing parents with reliable information on the schools’ performance, will create a marketplace for schooling that will evolve toward what parents want, be more innovative, and become more productive. Creating an even playing field for schools will allow those that are responsive to the needs of parents and students to prosper. Evidence from economics, much of it subsumed in the literature on the theory of firms, as well as considerable research in education, indicates that schools respond to competitive pressure. For example, West and Woessmann find that performance on international examinations by fifteen year olds in twenty-nine developed countries is positively associated with the share of the K-12 education marketplace that is held by private schools in those countries. Just as a managers of for-profit entities have their desire for salary, perks, security, power, and prestige disciplined by the extent to which the firm that employs them competes successfully for customers, so too do managers of schools respond to circumstances in which there is competition for students and their funding. Federal policy makers could and should introduce more competitive pressures into public schooling. It is not enough to follow the prescriptions of fiscal federalism and move decision making back to states and local school districts. That was the status quo before the recent accretion of power in Washington, and it did not work well in terms of educational progress. A new federal policy should embrace the concept of fiscal federalism but insist that decentralization be accompanied by new and powerful mechanisms to enhance choice and competition. Choice and the competitive pressures on schools it creates can have a number of outcomes, including more advertising by schools, which can be positive in that it provides parents and other interested parties with better information on important features of schooling; more equality and social justice by giving everyone rights, options, and powers currently in possession primarily of the well to do and influential; and greater efficiency/productivity from our education system. Efficiency/productivity is particularly important, what with revenues scarce and the current arrangements not producing enough knowledge and skills for the nation’s long-term self-interest. We have developed our proposal in three steps. First, we identify the education responsibilities that should be centralized in Washington in light of the precepts of fiscal federalism. These responsibilities flow from the existence of significant externalities at the level of local provision of education services. Second, we provide recommendations for federal action to increase the quality and usability of the information available to parents on which to base school choice and to support schools in their efforts to be more productive. Finally, we propose federal actions to increase substantially the competition for students among education providers. These three components are inextricably linked in our model: fiscal federalism will fail, as it has historically, unless it is combined with vigorous competition among education providers. In turn, vigorous competition combined with fiscal federalism will produce more disruption than educational progress unless consumers of K-12 education services can make choices informed by valid and useful data on the performance of education providers and unless education providers have a knowledge base from which to improve their practice. We propose a package of reforms that will only work as a package. Our goals are improved education outcomes, more equal education opportunity, and the fundamental reform of the current wasteful and ineffectual federal role in education. The Land Ordinance of 1785 set aside tracks of land for the support of public schools in each new state admitted to the Union from the Northwest Territories. William A. Fischel, ed., The Tiebout Model at Fifty: Essays in Public Economics in Honor of Wallace Oates (Cambridge: The Lincoln Institute on Land Policy, 2006). Terry Moe, Special Interest: Teachers Unions and America’s Public Schools (Washington: The Brookings Institution Press, 2011). Charles M. Tiebout, “A Pure Theory of Local Expenditures,” The Journal of Political Economy 64, 5 (1956): 416-424. Paul E. Peterson, City Limits (Chicago: University of Chicago Press, 1981). Tim R. Sass, “Charter Schools and Student Achievement in Florida,” Education Finance and Policy 1 (Winter 2006): 91-122. Caroline M. Hoxby, “School Choice and School Productivity (or could school choice be a tide that lifts all boats)?” in The Economics of School Choice, ed. Caroline Hoxby. (Chicago: University of Chicago Press, 2003), 287–302. Martin R. West and Ludger Woessmann, “’Every Catholic in a Catholic School’: Historical Resistance to State Schooling, Contemporary School Competition, and Student Achievement Across Countries,” The Economic Journal 120, 546 (2010): F229-F255. The benefits of information on school performance and evidence on what works in education are primarily a public good. That is, if one person has information on school performance and evidence of what works, that does not lessen the amount of information and evidence another person can have. If someone produces information and evidence, that person can give it to another person without losing that evidence. In such situations, a serious free-rider problem exists: because it is impossible to prevent a class of consumers who have not paid for the information and evidence from consuming it, far too little evidence will be produced if it is not supported by an organization with all the nation's interests at heart. The free-rider problem is one reason that state and local authorities cannot be entrusted with the task of knowledge production. Furthermore, evidence does not merely need to be produced; it needs to be based on high-quality data. But gathering and auditing data are almost pure public services. That is why even when information on school performance is treated as a private good to support more informed consumer choice (e.g., college search sites that require a fee for access), the information that customers pay to access is derived overwhelming from federal sources. In short, it is easy to justify federal support for research, data gathering, and dissemination. Although federal budgetary support for knowledge production in education has increased in the last decade, it remains a pittance when compared with levels of investment in research, evaluation, and statistics in other areas of the economy. For example, more than 40 percent of the discretionary budget of the US Department of Health and Human Services is invested in knowledge production and dissemination through the National Institutes of Health, the Centers for Disease Control, the Food and Drug Administration, and many other operational components. In the US Department of Education, the corresponding investment is less than 1 percent. With such meager levels of investment, the nation should not expect breakthroughs in areas that are ripe for research and development such as instructional technology. In education research and development, no less than in health or transportation or communication or energy, the public gets what it pays for. If a school or educational policy unjustly discriminates, it does so to produce benefits for some people at the expense of others' opportunities to develop their human capital. Unjust discrimination (i.e., denying a student an educational experience for which the student is qualified based on the student’s race, gender, disability, or other protected status) is the direct creation of an externality that will be costly to society. Logically, the federal government has an interest in curbing the creation of such externalities, especially if the consequences spread through all of society, not just the local area. Owing to mobility and societywide redistribution, we all suffer if a school unjustly discriminates. Those discriminated-against students fail to get educated; need cash transfers as adults; and might take up crime or engage in other antisocial behaviors. Thus, the federal government, not merely the state or local governments, should attempt to curb discrimination. The protected classes are those whom society observes to be routine targets of unjust discrimination; further, the arguments against discrimination and for equal protection under the law do not stand exclusively on an economic rationale. The nation’s commitment to justice, fairness, and equality is firmly grounded in moral philosophy and history. A high-need student, regardless of the source of the need (disability, lack of English proficiency, poverty) is expensive to educate. Such a student therefore generates a negative externality on the students who attend the same school or school district: resources are moved toward the high-need student and away from the other students. Other students, if they are able to do so, will therefore avoid being in school with high-need students. The burden that the high-need student produces will thus be disproportionately borne by those who are unable to avoid it. For instance, poor immobile students bear much of the burden of the externalities created by their fellow high-need poor students. The federal government can counteract these inequities through cash transfers: there is little need for other direct federal action. If the federal government attaches a fee supplement to each child who generates such an externality, it can address the problem. The difficulty is figuring out the right fee supplements. States as well as the federal government have played and will continue to play a role in financially offsetting the externalities generated by the uneven geographical distribution of high-need students and the tax base to support their education. Although it could be argued that fiscal federalism could assign this redistributive function to state governments rather than centralizing it in Washington, the problem is that there are significant externalities at the state level (e.g., Mississippi has a larger proportion of economically disadvantaged high-need students than Minnesota). It is to the nation’s advantage and thus a federal responsibility under the percepts of fiscal federalism to even out the disparities among states in their fiscal ability to educate high-need students. It is not just economics that undergirds this federal role; it is a moral philosophy that values justice, equality, opportunity, and fairness. We have argued that fiscal federalism has not and will not work well to improve education outcomes and equity if it relies solely on residential mobility as the competitive mechanism that drives school districts to improve education services. Such a system consigns the poor and immobile to inferior schools and leaves the control of schools in the hands of those who benefit most from the status quo. The federal government has a long and constitutionally sanctioned role in promoting competition through the Commerce Clause and plenty of carrots and sticks at its disposal through its discretionary grant programs and regulatory authority to break down the barriers to trade that local school districts and states impose on the provision of education services. Whereas in postsecondary education the federal government supports school choice through a system of grants and loans to students that are completely portable and through accrediting bodies for higher education institutions that are regional and national, at the K-12 level its funding mechanisms and recognition mechanisms support fifteen thousand-plus legally constructed district monopolies and fifty legally constructed state monopolies. By simply shifting its policies on K-12 education to those it has adopted for postsecondary education, the federal government could carry out a legitimate and critical role in a federalist system (a test that many of its current K-12 programs fail), provide to parents something every parent wants (the right and opportunity to choose where their child is schooled), and create a powerful engine for innovation and productivity in US education. We recommend that the three of the four federal functions we identify as essential—knowledge creation, civil rights enforcement, and cash transfers to support the education of high-need students—continue to receive strong support at the federal level but not necessarily through the forms by which these functions are presently legislated and administered. We recommend that the fourth function, creating competition and choice, proceed through a new mechanism: allowing states to opt out of most of the present and anticipated federal initiatives in education in exchange for creating vibrant marketplaces for an informed choice of schools. The largest federal K-12 education programs administered by the US Department of Education, Title I of the ESEA and the Individuals with Disabilities Education Act (IDEA), are designed to disburse funds to states and school districts for the education of high-need students. Rather than the complicated and intrusive federal schemes under which funds are presently disbursed under Title I of ESEA (for economically disadvantaged students) and IDEA (for students with disabilities), funds should be attached to individual students to be transferred to the schools and educational services used by those students. Individual schools would receive federal funds based on student counts, with a weighting formula to adjust for factors such as the increased burden of educating high concentrations of high-need students and for regional differences in the costs of services. There is nothing radical or untested about our proposal for weighted student funding, sometimes called backpack funding because the funds are attached to individual students who carry that resource to whichever school they attend. A 2009 report identified fourteen school districts that had implemented some form of weighted student funding. Many more are considering moving toward it, most recently Philadelphia. In general, the experience with backpack funding is that more funds go to the schools that serve needy students than under traditional distribution schemes, which is exactly what is intended. Some would argue that Title I of ESEA is a form of weighted student funding in that districts receive funding in proportion to the number of students they serve from economically disadvantaged backgrounds. From its beginning, however, Title I funding has been directed to school districts rather than to individual schools. Although funding is supposed to favor high-poverty districts and the highest poverty schools within those districts, the funding formula distorts that intent. The most recent national evaluation of Title I found that the lowest poverty schools received 37 percent more per enrolled low-income student than the highest poverty schools. Given the intent of the law that disparity should flow in the opposite direction. Twenty-seven percent of Title I funds received by school districts do not find their way into instructional expenditures at all, being used for administration, transportation, student services, and the like. If the American people and Congress want the roughly $15 billion in funds that are appropriated annually under Title I to get to the schools that serve economically disadvantaged students, they need to attach the funding to students rather than dispersing it to districts through complex and politically motivated formula. The same is true of the roughly $12 billion in IDEA funding. A school that enrolls a high-need student should be able to count on a supplemental deposit of a known amount to its operating budget. As some of the authors of this report have demonstrated empirically, beyond a threshold level it is how money is spent rather than per pupil expenditure itself that is most directly related to student achievement. Huge differences exist among school districts in how productively they invest their funds. For example, the Wisconsin school systems of Oshkosh and Eau Claire are about the same size, serve similar student populations, and get largely similar results on state exams–but Eau Claire spends over $1,000 more per student than Oshkosh. In a larger frame, the United States spends more per student on its education system than almost any other developed country in the world without world- leading results. Increasing productivity in education is extremely important. Schemes for providing compensatory funding for the education of high-need students need to enhance the productivity of the institutions that serve those students. Simply handing out more money to school districts will not raise student achievement substantially for students with special needs. Our proposal creates the necessary link between compensatory funding for high-need students and increasing the productivity of the education providers who serve those students. It does so through the competitive mechanisms detailed subsequently in this report. Weighted funding of individual students is a critical design feature of our model. It creates conditions under which federal cash transfers for high- need students support choice and competition and thereby increase the quality of schooling and the achievement of students. Were the federal government to restrict its role to serving the four functions we have identified—knowledge production, civil rights protection, compensatory funding, and promoting choice and competition—many present programs would fall by the wayside. Head Start is not administered by the US Department of Education but is nevertheless a prime example of a large federal education program that does not make sense in the context of fiscal federalism—a preschool program designed and administered in Washington, DC, is as far removed from the consumers of the services of a local preschool program as it is possible to be. Further, Head Start has been driven by an education philosophy that is increasingly distanced from what is known about the need of preschoolers for preacademic skills such as letter naming, phonemic awareness, and vocabulary and from research findings of the best approaches to inculcating those skills. Strong evidence suggests that whatever impact Head Start has on the skills and dispositions of the young children it serves has been dissipated by the time those children are in the first grade. To the extent that preschool services for children from low-income families are subject to externalities that are best handled at the national level, they can be addressed through the same type of cash transfers we have recommended for economically disadvantaged students under Title I of ESEA and students with disabilities under IDEA. This is a mechanism the federal government already employs through its program for subsidizing child care expenses for low-income parents and through tax credits. A second example of federal action that falls outside the principles of fiscal federalism involves curriculum development. For more than fifty years, the National Science Foundation (NSF) has channeled millions of dollars into developing curriculum, primarily in mathematics and science but also in other subjects. These curricula have a mixed record of success and often provoke controversy. In the 1970s, Man: A Course of Study drew sharp criticism from opponents who claimed the curricula contained material offensive to religious groups. In the 1990s, several NSF-funded mathematics programs came under fire for promoting one side in what were known as “the math wars.” Programs such as Everyday Mathematics; Investigations in Number, Data, and Space; Connected Mathematics Project; and Interactive Mathematics Project received tens of millions of dollars in NSF money—first, in initially developing textbooks and then through NSF projects that offered financial inducements to districts’ adopting the programs. The federal government’s role in knowledge creation is to promote sound, impartial evaluations of curricula and to fund the research and development of innovative instructional materials through impartial, open, and rigorously reviewed competitions. It is not to promote the development of one particular program or one particular curricular philosophy. It is certainly not to incentivize states and school districts to adopt its preferred curriculum. Many other programs would have to be jettisoned (or radically overhauled), in addition to Head Start and NSF curriculum development, under our concept of the federal role, unless those programs were reconfigured as small demonstration or research and development programs (that is, as programs designed to generate knowledge of what works). Let’s take as an example a program that is near and dear to the hearts of most education reformers, the Teacher Incentive Fund and the Obama administration’s proposed replacement, the Teacher and Leader Innovation Fund. Those federal programs have as their goal changing compensation systems at the school district level so that teachers and principals are evaluated meaningfully and rewarded for increases in student achievement. Laudable as that goal may be, determining how teachers and principals are evaluated and compensated by local schools is not an appropriate federal responsibility under the precepts of fiscal federalism. The compelling present need for federal intervention in local teacher evaluation and compensation systems derives from local school districts’ being public service monopolies whose most politically powerful constituents are their employees. But were real competition for the provision of education services present at the local level, the current system, in which there is little meaningful evaluation of instructional staff and salary is determined almost entirely by seniority, would be immediately disrupted. Education providers outside the traditional school district would almost certainly introduce human resource policies and procedures designed to be more effective and efficient than those employed in traditional school districts, as we have already seen in the charter school sector. We use the example of the teacher incentive fund with its laudable goals and obvious present need to emphasize that thinking about what the federal government needs to do to create higher levels of school and student performance changes once the present system is disrupted by strong and pervasive competitive pressure. We could as easily have constructed the example around other popular reforms, such as school turnarounds, lengthening the school day and year, and strengthening alternative routes into teaching. What may seem an absolutely essential federal intervention given the current hierarchical monopoly of public education can be seen as unnecessary, given the presence of true competition at the local level. In our formulation, if the federal function isn’t primarily about the provision of information, protecting civil rights, compensatory funding, or supporting choice and competition, it would go by the wayside. Caroline Hoxby, “The Potential of Markets in Primary and Secondary Education. Clarendon Lecture 1” (lecture, Oxford University, Oxford, UK, February 7, 2011). Paul Hill, Marguerite Roza, and James Harvey, Facing the Future: Financing Productive Schools (Seattle: University of Washington, The Center for Reinventing Public Education, 2008). Lisa Snell, “Weighted Student Formula Yearbook,” (Reason Foundation, 2009), http://reason.org/files/wsf/yearbook.pdf. Backpack funding was the original principle underlying the spending approach that President Lyndon Johnson used to pass ESEA in 1965. See Patrick McGuinn and Frederick Hess, "Freedom from Ignorance: The Great Society and the Evolution of the Elementary and Secondary Education Act of 1965," in Sidney M. Milkis and Jerome M. Mileur, editors. The Great Society and the High Tide of Liberalism (Amherst: University of Massachusetts Press. 2005). Stephanie Stullich, Elizabeth Eisner and Joseph McCrary, “National Assessment of Title I Final Report, Volume I: Implementation,” U.S. Department of Education, Policy and Program Studies Service, Office of Planning, Evaluation and Policy Development, (October 2007). http://ies.ed.gov/ncee/pdf/20084012_rev.pdf. Eric Hanuskek, ed. Courting Failure: How School Finance Lawsuits Exploit Judges’ Good Intentions and Harm our Children (Stanford: Hoover Institution Press, 2006). Ulrich Boser, “Return on Educational Investment: A district-by-district evaluation of U.S. educational productivity,” Center for American Progress, (January 2011). http://www.americanprogress.org/issues/2011/01/pdf/dwwroi.pdf. OECD, Education at a Glance 2011: OECD Indicators, (OECD Publishing, 2011). Chester E. Finn Jr. Reroute the Preschool Juggernaut (Stanford: Hoover Institution Press, 2009). http://www.hoover.org/publications/books/8138. U.S. Department of Health and Human Services, Administration for Children and Families Head Start Impact Study. Final Report, Washington, (January 2010). As a condition of receiving federal funds to support the education of individual students, schools should be required to participate in an open enrollment process conducted by a state-sanctioned authority. Such a process would maximize the matches between school and student preferences and assure that schools do not discriminate against protected categories of students. For the vast majority of families with school-aged children, residential address determines the public school the family’s children can attend. The school district assigns the child to a school, typically the one closest to the family’s residence. This assignment policy strongly affects those parents who want the best schooling possible for their children: a quarter of parents of school-aged children report that they moved to their current neighborhood so their children could attend the neighborhood school. Another 11 percent of families chose for their children to attend private schools. Charter schools and homeschooling account together for another 6 percent of the school-aged population. Fifteen percent of school-aged children attend parent-selected public schools (i.e., schools to which the parents apply for their child’s enrollment). Thus more than 50 percent of parents of school-aged children have engaged in some form of school choice, albeit primarily in the form of residential choice and private school tuition: two socially inequitable means of determining where a child attends school. There is little doubt, based on the long waiting lists for popular public schools of choice, that many more parents wish to exercise choice than are currently able to do so. Market-based competition cannot exist in public education unless the consumers of public education can choose where to be schooled. A system that requires that school choice be exercised primarily by the purchase of a home in a particular neighborhood or through the payment of tuition to a private school is inefficient and seriously disadvantages those families who are immobile because they are poor. This produces the very externalities we previously described, that is, schools filled with students whose parents did not have the resources to flee the residential area with which the school is linked. Even when public school choice is made available to parents, as it has been for the above-mentioned 15 percent, it is frequently administered in ways that blunt its potential to increase competition or to create the best match between parental preferences for schools and schools’ preferences for students. For example, the city of Denver has an open-enrollment process in which parents can apply for their child’s admission to almost any public school in the city. Although the system is currently in the midst of change, in the recent past each individual school had its own set of operations to govern enrollment, a large degree of individual control over admissions, and its own admissions records. This creates strong information asymmetries that undermine the ability of parents to obtain admission for their child in the school they prefer. Parents must rely on informal networks for information about the admission process at individual schools and may have express preferences for schools that differ from their true preferences to game the system (e.g., applying to one school as first choice because it is thought to be easier to get into rather than applying to the school the parents would prefer). Other open-enrollment systems begin with a default district-assigned school and require parents to protest that assignment to enter the choice system. Other districts provide such a strong preference weight to families who live in the neighborhood of a school that the appearance and reality of choice disagree. Few district enrollment systems that are portrayed as providing parental choice include charter schools in the choice framework. Thus parents are frequently required to coordinate different admission processes and decision timetables for traditional public schools of choice and individual charter schools. The situation is further exacerbated if parents are juggling the possibility of private schools, multiple charter schools, and regular public schools. A well-worked-out solution to the challenge of matching applicants and schools is best known in the United States as the medical school residency match. Applicants for a medical school residency submit a rank-ordered list of their preferred schools to a centralized matching service. Similarly, residency programs submit a rank-ordered list of their preferred applicants to the same service. Neither applicants nor residency programs see each other's list. The two parties' lists are combined using a computer algorithm to create the optimal match of residents to programs (i.e., one that minimizes the discrepancies between program and student preferences). Related enrollment programs for public schools must be more complicated because of the requirement of equity in access to schools for disadvantaged students and the need to consider geographical proximity of students to schools. But school enrollment programs can be based on the same underlying theory as is employed in the residency match and can thus generate a more-or-less strategy proof process (i.e., both parties’ interests are best served by expressing their true preferences and the distance between preferences and assignments can be minimized for the applicants and schools). Such enrollment programs have been established in New York City and Boston and have been in existence long enough for their theoretical virtues to have been seen in action. The principal problem with these model systems is the number of students who do not match (e.g., most recently 10 percent in New York City), which is disruptive and anxiety producing for parents and for schools. A significant portion of such matching failures, however, are due to easily correctable design failures, such as allowing parents to list only two or three schools rather than requiring them to list ten or more. The systems can be improved; the issue is not whether they are perfect but whether they provide better outcomes and more parental satisfaction than the systems they replace. They do. We believe that unified open-enrollment systems that encompass as many choices as possible from the regular public, charter, private, and virtual school universes are essential to the expansion of choice and competition in K-12 education. These systems must be designed with the same temporal parameters for applications and admission decisions for all schools and so that they cannot be gamed by either schools or applying families. Being able to see where parents want to send their children to school (i.e., schools’ revealed popularity) is the informational bedrock on which both market-based and administratively managed competition lies. In a true market-based economy for education services, schools’ revealed popularity plays the same function as long lines waiting to get into a movie or a restaurant: the entity provides something that many see as valuable. Publicly visible signs that a restaurant is popular create more demand for that restaurant and the customer base grows. In an administratively managed system such as a traditional local school district, revealed popularity should (although today it often does not) provide a signal to guide decisions on budgeting for school expansion and contraction and on the performance of school leadership. For example, principals of popular schools might be more likely to get their contracts renewed or receive bonuses compared with principals of unpopular schools. For school popularity to have its intended influence, it must be clearly and widely revealed to the public. Thus just as the proportion of admissions to applications (i.e., the selectivity rate) is available on numerous websites for all institutions of US higher education, so too must the revealed popularity of US K-12 schools and programs be easily accessible. We stress that an open admissions process for K-12 schools must build in procedures for assuring that students are not discriminated against based on their membership in a protected class. There are three ways to accomplish this goal. The first is to use a lottery for admission to oversubscribed schools. This is currently required in federal regulations for start-up charter schools if they are to qualify for federal aid and has the advantage that schools cannot discriminate in admissions based on student characteristics that are protected by civil rights laws. The disadvantage is that schools cannot discriminate in admissions based on student characteristics that are not protected, meaning that it prevents the use of admission processes that support specialized schools that are intended to serve the needs of students with unique needs and abilities (e.g., a high school for the performing arts that would admit students through auditions). A second approach is to attach administrative processes to admissions, commonly called controlled choice, that assure proportionality between protected classes of students and the resulting student body. Conservatively, this proportionality could be achieved with respect to the applicant pool. Thus with race as the protected category, the admissions algorithm would ensure that black students were offered admission to a particular school in proportion to their membership in the pool of applicants. More aggressively and in keeping with the concept of proportional representation that has played out in a number of legal actions, the algorithm could seek to achieve as close a match as possible between the proportion of the protected class in the catchment area of a school and the proportion of that class offered admission. Thus if the proportion of students with disabilities with geographical access to the school were 11 percent, then 11 percent of a school’s offers of admission would go to students so categorized. The advantage of such enrollment schemes is that they achieve at least gross equity of access and spread the often greater costs of educating protected classes of students evenly across education providers. Disadvantages include the need to define a catchment area, which becomes increasingly archaic as more education is provided online, and all the arguments and issues that have been raised in an extensive literature and public policy debate on race-based preferential admissions to postsecondary institutions. A third approach, which we hinted at previously, is to attach a fee supplement to students in protected classes with the result that they are admitted to the schools their parents prefer them to attend with roughly the same probability as students in nonprotected categories are admitted to the schools their parents prefer them to attend. A sophisticated matching algorithm could achieve this dynamically by adjusting the fee supplement during a prematch period to achieve parity of preference by schools for students in protected and nonprotected categories. Thus if the initial match between schools and students based on a default fee supplement resulted in a negative impact on high-need students, the funding entity would have to raise the supplement for such students, after which participating schools would again list their preferences for student admission. On the other side of the equation, if the initial match based on a default fee supplement resulted in high-need students being preferred, the funding entity could reduce the size of the supplement and conduct another matching round. The advantage of this approach is that it assigns a true market price to the externalities that often accompany the education of students in protected categories, with that price being paid by all citizens through state and federal tax revenues. The disadvantages include that no such enrollment system presently exists so there is no experience associated with it; that the costs of the fee supplements cannot be known and budgeted for in advance (although they could be well estimated after some experience with the system); and that schools that are indifferent to the loss of the fee supplement could discriminate—although the latter could be mitigated through routine civil rights enforcement actions. Clearly, there is much work to be done on the design and implementation of K-12 enrollment systems that provide the maximal choice to parents and valid information on school popularity. We note, however, the considerable progress that has already been made in implementing strategy-free enrollment processes in the public schools in New York City and Boston. The challenges that must be addressed are largely around equity of access and the inclusion of the universe of available schools, including private schools. Were federal funds for high-need K-12 students available to any accredited education provider, as is the case in postsecondary education, private schools would have a reason to participate in an open-enrollment system. Designing an effective choice architecture is relatively simple compared with many of the challenges facing K-12 education in the United States. And the dividend will be huge. The chicken-and-egg problem for ESEA reauthorization (i.e., how can the federal government require choice when the necessary choice architecture is present only in a few jurisdictions) can easily be addressed by providing states that adopt choice systems a release from a variety of other federal regulations and by providing competitive funding to entities that design and manage such systems. As a condition of the receipt of federal funds to support the education of individual students, schools be required to participate in data collections to be used to report to the public on the performance of individual schools. The federal government should competitively fund the designers and implementers of school choice portals. Just as people may be lined up to see a movie or eat at a restaurant for what film critics and nutrition experts might judge the wrong reasons, so too can the revealed popularity of schools send a false signal about school quality. In the postsecondary arena, for example, that the University of XYZ is more selective than the College of ABC sends a fuzzy signal, at best, as to whether XYZ provides a superior education. The potential for choice and competition to improve the quality of schooling depends on parents having good information on which to base their choice of school. Suppose that, per standard economic theory, parents are prepared to act rationally in their choice of schools. In other words, they know the outcomes they want for their children, calculate the probability that each of the schools available to them will produce those outcomes, and select the school that maximizes the probability of those outcomes. Of course, parents choosing schools for their children are no more fully rational than people choosing restaurants at which to eat, but even were parents disposed to act rationally, they currently operate under severe information constraints that hamper their ability to maximize the outcomes they seek. The only information parents are presently entitled to with respect to school performance is from district and school report cards that are required under the ESEA. This information, however, is insufficient to allow parents to make the best decisions for their children (e.g., it lacks any measures of consumer satisfaction; academic achievement indexes do not take into account the value added by schools; measures of teacher effectiveness are absent). Some missing information is held by districts and states and not released to parents and the public, which allows the education bureaucracy to manage choice in ways that serve its interests, rather than those of students and parents. Further, the information that is made available to parents is typically presented in ways that degrade whatever value it might have. Local school districts are presently responsible for presenting information to parents to support school choice, but they have significant incentives to hoard that information and to present it in a self-serving manner. For instance, they may wish to present themselves as attractive, spread enrollments across school facilities, minimize transportation costs, and reduce the influence of actors outside the management bureaucracy. These self-serving tendencies are not theoretical; roughly half of all districts required to offer school choice due to low-performing schools under the current ESEA notify eligible parents well after the school year has already begun. What parent wants to transfer her child to another school partway through the school year, with all the disruption in learning and relationships with peers that will result? Whether some school districts notify eligible parents at all is in question: about a quarter of parents with a child eligible for choice indicate that they have not received notification about this option from the school district. Because school districts are interested parties in the choice transactions made by the population they serve, we recommend that they should not be the architects and managers of either the choice process or the provision of information that would be the primary resource for parents. The federal government could launch competitions to fund independent entities to carry out these tasks; it could fund states to carry out such competitions; or it could simply require states to establish choice processes that are at an arm’s length from schools as a condition of receiving discretionary funds under the ESEA and IDEA. As we have indicated, parents need more and different types of information than they are presently receiving from federally mandated school report cards. Among the types of the now missing information that could be required are the percentage of inexperienced teachers in a school; popularity of the school in districts that offer open enrollment or as measured through parental satisfaction surveys; tenure of the principal and past performance of schools in which that principal has served; the transfer rates for students; absentee rates for teachers; absentee rates for students; curriculum focus in key subjects; availability of extracurricular and after-school programs and rates of student participation in those programs; annual operating budget of the school expressed as overall per pupil expenditure and instructional per pupil expenditure; rates of detention and disciplinary actions; gain scores on districtwide assessments; availability of accelerated and advanced coursework (e.g., advanced placement courses and levels of student participation and performance in those courses); and, for high schools, graduation rates and college enrollment and persistence rates. How information is presented to parents is also important. A federal study of Title I implementation found that most school choice notification letters to parents omitted key types of information, such as the schools parents could choose, and that the average notification letter was written above an eleventh-grade reading level, which is another reason that the systems that support school choice need to be independent of the schools and the school systems that are the entities being chosen. The medical residency match would not work if it were left up to individual medical schools to manage it. Strong evidence exists that providing better information on school performance combined with opportunities for school choice affects parental behavior and student outcomes. For example, Hastings and Weinstein conducted an experiment in the Charlotte-Mecklenburg School District in which information sheets clearly and simply describing and comparing schools’ academic performance were distributed along with school choice forms to parents with children in randomly selected schools serving primarily low- to middle-income neighborhoods. Parents in the control schools in the same neighborhoods received either no information on school performance or, if they were in schools that were sanctioned under NCLB, the federally mandated information. The researchers found that providing parents with direct information on school test scores resulted in significantly more parents choosing higher-scoring schools for their children. In turn, children of parents in the informed-choice group subsequently evidenced significantly higher academic achievement than children of parents in the low-information choice condition. Where do common state standards and assessments fit in our model of information provision? Nothing in our model compels the federal government to establish or aid and abet others in establishing uniform national standards and assessments. An argument consistent with our framework can be made for such common standards and assessments in that we have reserved an important federal role for the provision of information on the performance of schools. A common set of standards and assessments makes the task of providing that information easier than is presently the case with disparate state standards and assessment. There is a downside, however: as many opponents of national standards have argued, they provide a homogenizing influence on curriculum and instruction that is not desirable if one favors the availability to parents of choice among education providers’ offering differentiated products. Our position is that parents choosing schools need valid information on school performance if the markets we envision are to be driven by competition based on variables that matter for student outcomes. Most certainly the variables that matter include academic achievement. Thus in our view every school that enrolls students who are supported with public funds needs to be subject to an assessment regimen that results in valid information on how well students in that school are learning. Because the question of how well students are learning is inherently comparative, students must be assessed with instruments that are standardized, normed (ideally nationally but at least at the state level), and relevant to the curriculum of instruction to which the students are exposed. This could be achieved with common standards and assessments across states and across schools within each state. That course of action has, at least, the advantages of economy in the investments needed to create standards and assessment and the provision of an unambiguous common yardstick to measure progress. It could also be achieved, albeit at more expense and with more ambiguity of results, by allowing schools to utilize any of a number of standards and assessment systems that have passed muster with the state education agency as being standardized, normed, and relevant to the program of instruction. The norming of all of these systems of standards and assessments would allow a common yardstick among schools for the academic progress they generate in their student bodies (e.g., the average seventh grader moved from the 32nd to the 41st percentile over the course of the year, without requiring that the content and standards be the same for the seventh graders in every school). Either common core standards and assessments or multiple systems of normed standards and assessments are consistent with the model of federal reform we put forward. Both courses of action reveal to parents valid information on a school’s performance in raising academic achievement so they can make an informed choice. U.S. Department of Education, National Center for Education Statistics. The Condition of Education 2006 (NCES 2006-071). Washington: U.S. Government Printing Office (2006). Atila Abdulkadiroglu, Parag A. Pathak and Alvin E. Roth, “Strategy-proofness versus efficiency in matching with indifferences: Redesigning the New York City High School Match” (National Bureau of Economic Research Working Paper No. 14864, 2009). Liz Robbins, “Lost in the School Choice Maze,” New York Times, May 6, 2011, http://www.nytimes.com/2011/05/08/nyregion/in-applying-for-high-school-some-8th-graders-find-a-maze.html?_r=2&ref=education. Of course, parents can rationally choose schools based on nonacademic grounds such as geographical proximity, just as restaurant goers factor in things like location and parking and ambience into their selection of eating places. Stullich, Stephanie, Elizabeth Eisner, and Joseph McCrary (2007) National Assessment of Title I, Final Report: Volume I: Implementation. Washington, DC: National Center for Education Evaluation and Regional Assistance, Institute of Education Sciences, U.S. Department of Education. Justine S. Hastings and Jeffrey M. Weinstein, “Information, School Choice, and Academic Achievement: Evidence from Two Experiments,” The Quarterly Journal of Economics (November 2008): 1373-1414. Note that national norming is not particularly expensive. Sample sizes of around 3000 students would be sufficient, and such norming is carried out routinely for psychometric assessments used in clinical practice that have far lower usage and sales rates than could be expected for assessments to be used in thousands of schools. We have indicated that fiscal federalism will not be a successful education reform unless it goes hand in hand with competition for students among education providers in local education markets. On what basis can the federal government take action to increase competition in K-12 education? We recommend that states be required to establish a system for authorizing charter schools that allows the charter school sector to engage in orderly expansion to meet demand; provide funding under the same weighted formula that applies to all other publicly supported schools; and provide access to capital funds through a mechanism equitable with district funding. Charter schools are essentially the only competition to regular public schools systems for most low- and moderate-income families. Charter schools are public schools of choice (rather than residential assignment) that are operated autonomously, outside the direct control of local school districts. Since the first charter school was established in 1992, the charter movement has grown to include more than 4,900 charter schools in thirty-nine states educating 1.6 million children. The growth, however, has been insufficient to meet the demand. Many charter schools are oversubscribed; few charter schools close for lack of adequate enrollments. When the general public is surveyed, twice as many respondents say they favor charters as say they are opposed. Relative to statewide averages, charter schools tend to attract a disproportionate number of students eligible for free or reduced price lunches as well as minority students, especially African Americans. Initial test scores of students at charter schools are usually well below those of the average public school student in the state in which the charter school is located. Research on the effectiveness of charter schools in raising student achievement presents a mixed picture. Charter schools are not a homogeneous category in terms of mission and approach, so generalizing across them is perilous. In general, charter schools serving low-income and minority students in urban areas are doing a better job than their traditional public school counterparts in raising student achievement, which is not true of charter schools in suburban areas. Charter schools demonstrably increase choice, generate systemic competitive effects, and are popular with parents. In our view they are an essential ingredient in a marketplace for education that will serve as an alternative to the current hierarchical monopoly of traditional public schools. We believe charter schools require careful oversight through appropriately funded authorizing bodies, equitable funding via a backpack model, and the opportunity to grow based on their ability to attract students. Fulfilling the latter condition means that states that do not allow charter schools or that arbitrarily cap their growth or that turn their authorization over to the very school districts with which they compete should reform their practices. The Obama administration did this via the conditions it placed on the Race to the Top. We are in favor of such conditions being incorporated into the reauthorization of ESEA. The principled criticism against charter schools is that their performance as a group is not better than that of regular public schools and yet they remain oversubscribed. That will change, we believe, once the arbitrary caps on their growth are removed and parents are afforded a wider and more informed choice of schools. More equitable funding of charters and access to publicly financed facilities for charters might also yield better schools and stronger results. Once most schools are operating in a marketplace in which parents can freely choose and resources follow students, the advantage that charter schools currently enjoy as a resource with limited availability will disappear. Their true popularity will be revealed, and they will rise or fall based on the degree to which they serve the needs of the students for whom they and other schools compete. The federal government has a long history of promoting interstate markets through its authority under the US Constitution’s Commerce clause. As the judicial interpretation of that clause has evolved over time, it has come to include the federal authority to prevent state or municipal laws whose object is local economic protectionism (the so-called dormant or hidden commerce clause). For example, in Dean Milk Co v. City of Madison the Supreme Court found unconstitutional the Madison, Wisconsin, requirement that milk must be pasteurized within five miles of the city. The Court reasoned that Madison could have ensured safe milk through alternatives that were less discriminatory, such as sending inspectors to more distant milk-processing plants. Much of the anticompetitive force of local school districts is exercised through requirements that link publicly supported education services to geographical constraints, much like the provisions that the City of Madison imposed on vendors of milk. A leading example is restrictions on cyber charter schools (i.e., schools that offer most or all of their instructional programs over the Internet and do not have physical locations where students assemble). Presently such schools operate entirely in the context of the laws of individual states, which vary tremendously in terms of their recognition and regulation of cyber education. To the extent that such schools are allowed to operate at all, they typically do so in the context of charter school laws that include conditions such as a minimum number of hours of daily instruction that do not make sense in the context of courses delivered over the Internet that can be taken at a student’s own pace and that frequently define completion in terms of a mastery criterion rather than in terms of seat time in class. Further, there is presently no provision in any state’s laws or at the federal level for students to attend cyber charter schools that are out of state in the sense of having no physical place of business within a state. We believe that the dormant Commerce Clause could be applied to the provision of education services through the Internet. That is, the federal government could take legal action or support legal claims against states and local school districts that restrict or prohibit access to Internet-based educational services that are provided outside district or state borders. Just as was the case for the pasteurization of milk, districts and states can carry out their responsibilities for assuring the quality of public education services without imposing geographical constraints on where those services can originate. We believe that bringing K-12 education services into the twenty-first century by unfettering technology as a delivery mechanism will substantially enhance competition and productivity. Here as in many areas of school administration and performance, it is useful to compare postsecondary with K-12 education. In 2006, the most recent year for which national data are available, postsecondary institutions reported more than 12 million separate distance-learning course enrollments. Two-thirds of all postsecondary institutions offered distance-learning courses, and more than eleven thousand individual programs of study could be completed entirely online. This is a national rather than a local marketplace in that a student in Arizona can take a distance-learning course from the University of Maryland as easily as from the University of Arizona; the course credit that is generated by that enrollment can apply to graduation requirements at a large number of colleges and universities without geographically defined restrictions. Further, if the student residing in Arizona has qualified for federal student grants or loans, those grants and loans are attached to the student (i.e., backpacked), with the cash they represent being transferred by the federal government to the particular school and program in which that student enrolls, regardless of where that postsecondary provider is physically located. This is as true of brick-and-mortar education services as it is of distance learning. The contrasts with K-12 education are stark. In terms of access, whereas there were 12 million enrollments in postsecondary distance learning courses in 2006, there were only about 1 million such enrollments in K-12 in 2007. With roughly 50 million elementary and secondary students and 20 million postsecondary students in the United States, this means that the probability of a postsecondary student enrolling in a distance-learning course is presently three thousand times greater than the probability of such an enrollment at the K-12 level. Another difference is that the student is most frequently the customer for postsecondary distance education services, whereas in K-12 it is school districts and sometimes states that purchase and provide distance-learning opportunities (with homeschooling being the exception). In other words, the postsecondary student in Arizona can take a virtual course for credit from the University of Maryland, but his younger sibling cannot take a virtual course at all unless it is offered through his local school district. A side effect of virtual courseware and distance-learning providers’ having to make their sales to school districts rather than to individuals is that school districts are likely to be disrupted by distance learning and thus are reluctant customers. The result is that market demand is suppressed and that investment in new technologies for K-12 education is curtailed. A final remarkable difference between K-12 and postsecondary markets for distance learning is that the federal government is indifferent to distance- versus place-based learning and to state and local geographical boundaries in the provision of financial aid to high-need postsecondary students, whereas in K-12 that aid is funneled through local public service monopolies who hold captive the students in their geographical catchment area. The promise and potential of education choice is nowhere more evident than in the realm of technology. Local and state laws that are designed to discriminate against the interstate and out-of-district provision of education services in K-12 are ripe for legal challenges. School vouchers provide backpack funding that can be expended in private schools. Voucher and voucher-like programs have been enacted by a number of states and by Congress. All have focused on disadvantaged populations by giving them a voucher that will pay a part or all of the cost of attending a private school. We are in favor of making federal funds to support the education of high-need students as portable in K-12 education as they are in postsecondary education. The Pell grant is a federal backpack cash transfer program to support the education of low-income students in any accredited postsecondary institution of their choosing. Pell grants are not restricted to public college and universities; they can as readily be spent at a private or for-profit institution as at a public college. The same is true of federal funds to support preschool and daycare services for low-income working mothers. We see no federal constitutional or legal barrier to federal Title I and IDEA funds being similarly dispensed, although there are constitutional barriers in some states. The arguments for allowing students ready access to cyber and private schools extend to interdistrict school choice. The opportunities for students to attend public schools outside their district of residence are currently very limited. Interdistrict choice flowered briefly as a result of legal actions taken during the 1960s to compel metropolitan-wide desegregation efforts but waned after the Supreme Court, in Milliken v. Bradley (1974), ruled that racial separation induced by the choice of neighborhoods made by individuals was beyond judicial scrutiny. A number of school districts across several states have participated in voluntary interdistrict plans. One close observer estimates that roughly 1 percent of the public school population participates in such programs. The METCO program in the Boston metropolitan area, for example, has been in operation since 1966 and currently has more than three thousand students participating, with another twelve thousand (20 percent of the Boston school-age population) on the waiting list. Were the federal government to provide incentives for states to top up their district backpack funding for high need students, suburban schools might find it in their interest to admit students from outside their district boundaries. We favor this course of action. We have introduced the possibilities of federal actions that would improve choice and competition in the context of the Commerce Clause so as to ground such actions in a broader spectrum of federal responsibilities and legal interpretations. The actions we recommend, however, do not depend on or require a favorable interpretation of the Commerce Clause, which, like most constitutional provisions, has interpretations that vary among courts and legal scholars. The federal government has substantial legal room to increase local competition in the provision of education services by attaching conditions on grants of federal funds. For example, in New York v. United States, the Court held that Congress cannot compel state legislatures or state agencies to adopt regulations but emphasized that Congress can obtain similar results by attaching conditions to federal grants to states to induce the state action. Further, in Connecticut v. Spellings, in which the state of Connecticut sued then education secretary Margaret Spellings on the basis that the requirements in Title I of ESEA represented an unfunded mandate, the circuit court dismissed the case, and both the district court and the Supreme Court refused to take up the case on appeal. Clearly the federal government has the ability—through legislation—to tie all manner of conditions to the receipt of federal funds for education. The question is, Which conditions are most favorable to the nation’s progress and to equity of access? Kevin P. Brady, Regina R. Umpstead and Suzanne E. Eckes, “Unchartered Territory: The Current Legal Landscape of Public Cyber Charter Schools,” Brigham Young University Education and Law Journal 2 (2010): 191. Anthony G. Picciano and Jeff Seaman, “K-12 Online Learning: A 2008 Follow-up of the Survey of U.S. School District Administrators,” Sloan Consortium (2009) http://sloanconsortium.org/publications/survey/pdf/k-12_online_learning_2008.pdf. John E. Chubb and Terry M. Moe, Liberating Learning: Technology, Politics, and the Future of American Education (Stanford: Hoover Institution Press, 2009), http://www.hoover.org/publications/books/8137. Kara S. Finnigan and Tricia J. Stewart, “Interdistrict Choice as a Policy Solution: Examining Rochester’s Urban-Suburban Interdistrict Transfer Program (USITP)” (prepared for School Choice and School Improvement: Research in State, District and Community Contexts, Vanderbilt University, October 25-27, 2009). Richard D. Kahlenberg, Helping Children Move From Bad Schools to Good Ones (New York: The Century Foundation, 2006), http://tcf.org/publications/pdfs/pb571/kahlenbergsoa6-15-06.pdf. Erin Dillon, Plotting School Choice: The Challenges of Crossing District Lines (Washington: Education Sector, 2008), http://www.educationsector.org/sites/default/files/publications/Interdistrict_Choice.pdf. Charter schools, intradistrict open enrollment, virtual schools, vouchers, and interdistrict choice are critical components of the supply side of education choice. When combined with a supply of good information on school performance to parents and backpack funding, they create a dramatically different landscape for schooling than is presently available in the United States. To highlight where we are and where we need to go, consider the differences in the availability of choice in the District of Columbia and Atlanta. The District of Columbia is currently home to about a hundred public charter schools; it has a vibrant private school marketplace, including relatively low-cost parochial schools that are affordable to some lower-income families. It has a federally funded voucher program that allows some very low-income families to send their children to private schools. It routinely allows families with children who qualify for special education services to enroll their children in out-of-district schools. And it has an enrollment system that allows parents to compete for enrollment slots for their children in regular public schools that are out of the family’s neighborhood of residence. Although there are many important choice features it does not have, e.g., a school choice portal that coordinates and informs parents of all their options and backpack funding, it has many elements of the model we propose. Now consider Atlanta. It serves about the same number of students as DC but has only twelve charter schools and a small number of affordable private schools. It does not offer vouchers or easily support the enrollment of special education students in private or out-of-district facilities. Students are assigned to schools based on neighborhood of residence. Out-of-neighborhood school assignment only occurs through a cumbersome appeals process to the district. In effect, there is no choice in Atlanta, other than to buy a home in the neighborhood of a preferred school, move out of the city, or pay private school tuition. Without choice there cannot be marketplace competition. The situation in Atlanta is prototypical of larger school districts. Even the options of residential choice and private tuition that are available to affluent parents in places like Atlanta are not open to parents who reside in smaller districts or rural areas, where there may be no private schools and only one or two public schools serving an age group. Note that comparisons of performance on NAEP of districts with more or less choice such as Washington, DC and Atlanta are not a basis for evaluating the effects of choice-based reform because of the many other variables on which districts differ and the lack of inclusion of private school students in the NAEP urban district assessment program. One of the stronger research findings in education reform is that consequential accountability matters (i.e., schools perform at higher levels when there are meaningful consequences attached, such as making the school’s students eligible for school choice if the school is low performing). In a recent and statistically sophisticated examination of this issue, Dee and Jacob compared test score changes across states that already had school accountability policies in place prior to No Child Left Behind and those that did not. They found that introducing consequential accountability under NCLB generated statistically significant increases in the math achievement for fourth graders and improvements in eighth-grade math achievement among traditionally low-achieving groups. They found no effects for reading at either grade level. Hanushek and Raymond report similar findings for the state accountability systems that preceded NCLB. Shouldn’t the federal government continue its regimen of consequential accountability in the reauthorization of ESEA, given the empirical evidence of its success? Our answer is that top-down federal accountability (i.e., some evolution of NCLB) is necessary in the context of our current system of dispersed reform-resistant authority, but that it is not necessary (except for information reporting) for a truly competitive system in which parents can choose their schools, schools have incentives to perform, and schools are held accountable from the bottom up. Once the federal government takes on the role of defining the success of schooling in every public school across the nation, the shift of control from the local level to Washington is inevitable. And growth is certain from a federally defined and managed accountability system to federal specification of the practices that schools, districts, and states should engage in to achieve their accountability targets. Such growth is in exactly the present course of federal involvement. On the side of student achievement, its positive effects have been modest whereas it has damaged local and state decision making on education. Regulatory accountability managed from Washington may be superior to unfettered local and state school bureaucracies that resist reform and serve best those who work in the schools, but the status quo of the 1990s and the heavy hand of federal regulation are not the only two choices. Our choice-based model does not do away with consequential accountability. Rather it strengthens it by shifting its form from regulatory accountability designed in Washington to market-based accountability grounded on parental choice of schools, backpack funding of students, and valid and easily digestible evidence on school performance to guide parental choice. It is informed parents voting with their children’s feet and their share of the taxpayers’ dollars who hold schools to account in our model, not Congress and the executive branch. We have previously noted that there is substantial evidence that competition affects school performance, even in the diluted form in which competition presently exists in public education in the United States. For example, Hoxby compared traditional school performance before and after the introduction of charter school competition in Arizona and Michigan and found that the introduction of charter schools resulted in the improvement in the regular public schools of math and reading in fourth grade and math in seventh grade. Note the similarity in subjects and grades to the improvements attributed to NCLB accountability by Dee and Jacobs. Sass found that the concentration of charter schools within the geographical area served by regular public schools in Florida was associated with increases in student achievement in math, but not reading, in regular public schools. Holmes et al. found that the concentration of charter schools at the county level in North Carolina, which corresponds to the school district boundary in most cases, was associated with improvements in both reading and math in regular public schools. Booker et al. found large positive effects of charter school competition in Texas. A 1 percent increase in the proportion of public school students attending charter schools within a district was associated with a 15 percent increase in annual math score gains and an 8 percent increase in annual reading scores in the regular public schools. The effects of competition on math scores estimated by Booker et al. are on the order of magnitude for one year of the effects identified by Dee and Jacobs for NCLB from its inception in 2002 until 2007. West and Woessman find that performance on international examinations by fifteen–year olds in twenty-nine developed countries is positively associated with the share of the K-12 education marketplace held by private schools. Note that the Sass, Holmes, and Booker studies control for student prior academic achievement so the improving performance of regular public schools in the face of charter school competition is not due to lower- performing students transferring out of regular public schools into charter schools. In some studies, the empirical effects of competition are modest—statistically significant but too small to offer the promise of transformative effects on education. In other studies, however, the effects are sizable. Even in the studies with modest-effect sizes for the systemic effects of competition, they are not necessarily smaller than the empirically demonstrable effects of other reforms that have become popular. In thinking about the magnitude of effects on school performance that might be produced by a truly open and competitive school marketplace, it is important to consider that the competition for regular public schools that is presently provided by charter and private schools is weak. Unlike a private liberal arts college that will be forced to close or restructure itself if it cannot maintain enrollment (as more than 35 percent have had to do in the last twenty years), regular public schools are frequently buffered from enrollment losses. At the same time enrollment gains at charter and private schools may be a mixed blessing. To be specific, because charter schools are typically underfunded on a per pupil basis relative to regular public schools, and because funds for students do not flow directly via a backpack model from public schools losing students to charter schools gaining students, the economic competitive pressure on regular school administrators is muted. Further, for many charter schools, each student enrolled is a loss leader in the sense that the school has to raise private funds to cover the difference between the actual costs of educating that student and the public funding that is received. Further, there are often perverse positive incentives for regular public schools that lose students. For instance, overcrowding may be reduced and lower-performing students may be disproportionally those that flee, whereas funding may remain constant. Finally, competition as it presently exists in US public education does not conform to the models of information provision and choice architectures that we propose. In other words, when parents have choice at all they typically have to exercise it without valid and easily understood information on school performance. That the vast majority of studies of school competition in the United States find positive effects on school performance in the area of academic achievement is remarkable, given that the competitive pressures are weak and parents aren’t well informed. We believe that the existing research on the systemic effects of school competition in the United States is sufficient in and of itself to support the view that schools improve when parents can choose which schools their children attend. When research in K-12 education is combined with the voluminous research and theory on competition in other fields, we believe there is little rational basis for the position that schooling delivered through a hierarchical monopoly (the present system) will achieve better outcomes than schooling delivered through a marketplace in which parents have choice and information and funding follows students to the schools they attend. Thomas Dee and Brian Jacob, “The Impact of No Child Left Behind on Student Achievement” (The National Bureau of Economic Research Working Paper No. 15531, November 2009) http://www.nber.org/papers/w1553. Eric A. Hanushek and Maragret E. Raymond, “Does School Accountability Lead to Improved Student Performance?” Journal of Policy Analysis and Management, 2005, v24(2, Spring), 297-327. George M. Holmes, Jeff DeSimone, and Nicholas G. Rupp, “Does School Choice Increase School Quality?”(The National Bureau of Economic Research Working Paper No. 9683, 2003). Kevin Booker, Scott M. Gilpatric, Timothy Gronberg and Dennis Jansen, “The Effect of Charter Schools on Traditional Public School Students in Texas: Are Children Who Stay Behind Left Behind?” Journal of Urban Economics 64, 1 (2008): 123-145. Clive R. Belfield and Henry. M. Levin, “The Effects of Competition between Schools on Educational Outcomes,” Review of Educational Research 72 (June 2002): 279-341. Grover “Russ” Whitehurst, “Don’t Forget Curriculum,” Brown Center Letters on Education, The Brookings Institution (October 2009), http://www.brookings.edu/~/media/Files/rc/papers/2009/1014_curriculum_whitehurst/1014_curriculum_whitehurst.pdf. A marketplace for education should no more be free of government oversight and regulation than a marketplace for gas grills. People need to be protected from exploding grills, and students and their families, from fly-by-night operators and from persistently unsafe or ineffective schools. Consumer protection in the form of requirements that must be met by schools that enter into and continue to provide publicly funded services in the K-12 education market are an essential state function, notwithstanding the potential for excessive or unwise regulation. The requisite mechanisms already exist in the postsecondary market in the form of accreditation and for charter schools in the form of state or local level charter authorizers, although there is considerable room for improvement in both these mechanisms. Another important federal regulatory and oversight role concerns the structure and implementation of choice architectures to prevent even greater concentrations of high- need students in particular schools than we presently experience. More educated, affluent parents tend to be more active and informed consumers of education services for their children than less affluent, educated parents. Chile implemented a voucher system in 1981 that provided vouchers to any student who wished to attend a private school. The voucher program increased private school enrollment from 20 percent to 40 percent within the first seven years. Middle-class students, however, were much more likely than poor students to leave public schools for private schools. The Chilean experience illustrates that choice systems have to be carefully designed to avoid the result of students being sorted by race, economic background, and other conditions that represent externalities that the nation wants and needs to temper. We have previously described ways that choice systems can be engineered to avoid schools that are segregated on dimensions of student need. For example, the simple feature of eliminating a default school assignment by the school district—thus requiring every parent to engage in school choice—reduces socioeconomic differences in the likelihood that parents will shop for schools. Further, if the information on the school choice portal is designed to highlight clearly important variables of school performance rather than leaving it up to parents to sort through dozens of variables of varying levels of importance in frequently opaque displays, socioeconomic differences in knowing what’s important to consider can be muted. Here, again, the federal government has a role to play, for example by providing funding through open competitions for designers and implementers of school choice portals. Paul J. Hill, Charter Schools Against the Odds: An Assessment of the Koret Task Force on K–12 Education. (Stanford: The Hoover Institution, 2006). Because the foundation of our proposal is a system of choice transactions between parents and individual schools, it might seem that we have abrogated the role of states in providing for the education of their citizens, a role that is in many cases enshrined in state constitutions. That is not the case, for three reasons. First, we previously reported that the courts have determined that dangling a carrot in front of states in the form of federal funding in exchange for adopting federally specified reforms is not a mandate and does not violate constitutional strictures on federal action. Thus, making state adoption of the reforms we propose a condition for ESEA, Head Start, or IDEA funding represents, at a conceptual level, no more or less federal interference in state authority over education than the present requirements of ESEA. At a functional level it represents much less interference. States that do not wish to pursue reforms based on informed choice and student-based funding would not have to; those that do would be carrying out those reforms consistent with their constitutional authority. Second, the current state role in education has grown substantially at the expense of the role of school districts as a direct result of the ever increasing federal role. In effect, state departments of education have become wholly owned subsidiaries of the US Department of Education as their principal responsibility has become implementing federal education law and as their principal source of funds has become administrative set-asides in federal education grants. That some of these state administrative functions might be rolled back or eliminated under our proposal does not represent federal interference in the right of states to oversee education. Rather, the changes in state responsibilities under our proposal would primarily be a result of the federal government removing itself from many areas in which it has heretofore been active and prescriptive and in which it required states to be its implementing partner. Finally, our proposal places with the states the critical responsibilities that had been central to their roles prior to the growth in federal control. Among these are responsibility for determining whether individual schools or groups of schools within a state are licensed or accredited and appropriating funds for a variety of education purposes, including equalizing funding for schools that serve less versus more advantaged students. The backpack funding model we propose admits of many different design and funding decisions, all of which would be made at the state level. In addition, under our proposal, states would take on a new and critically important function: collecting and providing information on school performance in the context of choice systems in which parents shop for schools. In effect, under the system we propose, states set the bar for entry into the market of education providers; they decide how much funding is available from the state to support which K-12 education programs; and they provide or oversee the information and choice portals for parents on which the whole system rests. These critical functions under the precepts of fiscal federalism are best carried out at the state level and are consistent with state responsibilities for education under their own constitutions. We have proposed a three-pronged approach to a redefined federal role in education: 1. moving political decisions about education to the governmental entities that are as close as possible to the consumers of education while retaining and strengthening responsibility for activities that cannot be effectively localized because of externalities; 2. incentivizing competitive markets for education services at the local level; and 3. supporting informed parental choice. The three existing federal responsibilities to be retained and strengthened are knowledge production, civil rights protection, and compensatory funding for the education of high-need students. The compensatory funding would be in the form of a cash transfer that would follow students in a weighted capitation formula, aka a backpack model, rather than being parceled out to traditional school districts with hundreds of strings attached. The expansion of competition would be supported not only by the cash transfer funding formula that provides a direct link between school popularity and funding but also by a requirement that states support the establishment and growth of charter schools, support interdistrict choice, provide for open enrollment, and subsidize attendance at private schools by high-need students. To support informed parental choice of schools, the federal government would require that parents be able to avail themselves of school choice through independent school choice portals overseen by states that provide valid information on school performance, that generate the best possible matches between the preferences of parents/students for schools and the preferences of schools for students, and that ensure that high-need students have equitable access to the pool of schools from which all parents in a geographical area can choose. We expect there is broad consensus in the education reform community that the current hierarchical monopolistic arrangement of school boards, federal and state regulations, union contracts, teacher licensing, and court orders is frozen in place and has shown that it can resist or distort almost any new initiative into its own shape. We also expect that many in the reform community believe that this can be changed with a sharper federal whip and irresistible federal carrots. But the evidence that the federal government can legislate and regulate substantial increases in the effectiveness of public schooling is weak. By one credible estimate NCLB, a massive federal intervention, raised fourth-grade math scores by an amount equal to about four months of schooling over a five-year period and had no effect on reading at all. Are there good reasons to expect that more top-down direction from Washington will succeed dramatically when earlier efforts have had modest impact? We don’t think so based both on past history and the likelihood that the effort to centralize control in Washington will never be more than partially realized. The approach we recommend places the federal government in a central role in providing information, providing compensatory funding, protecting civil rights, and promoting a competitive and information-rich market place for education services. Mechanisms we espouse such as student-based funding, open enrollment systems, charter schools, and virtual education are having some success in breaking open the current system, but they require very special circumstances at the state and local level and are often short-lived. How can we make flexibility and continuous improvement in the core elements of public education instead of ephemera? The answer is to build choice and competition into the system. Only the federal government is in a position to do that by creating a set of conditions under which states can choose to pursue a choice reform agenda in exchange for freedom from other federal education mandates. We understand that our proposals, if adopted, would represent a fundamental shift in the federal government’s role in K-12 education. It is difficult for any institution to embark on a new path that affects broad swaths of its constituents, much less one with as much built-in inertia and penchant for incrementalism as the US Congress. We think that an attempt to reauthorize ESEA, IDEA, and Head Start to conform closely to our recommendations would likely fail. But there is a way forward--one with a rich legislative history and experience of success at the federal level. Let states opt out of the statutory and regulatory requirements of ESEA, IDEA, Head Start, and other federal laws prescribing particular approaches to the organization and delivery of K-12 education services in exchange for creating a marketplace of informed choice and competition along the lines of our recommendations. Many, perhaps most states, would opt for a continuation of current arrangements, both because of the political will of their electorates and because of their reluctance to disrupt the status quo from which so many powerful and influential constituents benefit. But some states, perhaps just a handful, will find the bargain of throwing off the federal yoke in exchange for providing maximum education choice for their citizens politically attractive and viable. Those states can serve as the laboratory for the proposals we have put forward. If these state initiatives fail to advance student achievement, social equity, and education productivity, and if they lose the support of the state’s electorate, they would be abandoned by the states, which would then return to the federal fold. Likewise, whatever Washington gives, it can take back: if the state option appeared to be damaging to the interests of the involved states or the nation the option could be withdrawn. On the other hand, if states choosing the state option experienced the success we think is likely, other states would find the risk of coming onboard manageable and, we think, would face an escalating demand for the state option from their citizens. The president and Congress are elected by the American people, and the education system clearly has vast consequences for this nation’s economy, society, and world leadership. The federal government has responsibility for protecting and promoting the general welfare and a crucial role in protecting and promoting precisely those interests of the overall general public that lower levels of government are not able to promote. The question is not the authority or the need of the federal government to do so but how it carries out that responsibility. With so much at stake and with the current education system performing less well than is needed, we neither expect nor recommend that the federal government place the authority over and control of schools in the unfettered hands of the very governmental entities further down in the hierarchy that have long created and been complicit in the problem. We believe the most promising means for federal action is to move decision making closer to the consumers of K-12 public education by unleashing their ability to choose schools for their children and by causing those choices to generate competitive pressures on the providers of education services. A state option provides a way for the federal government to move forward without imposing a new and very different federal role on states that do not want it. At the same time it provides an out for states that are currently chafing at the federal bit. Allowing states to opt out of a federal mandate in exchange for embarking on a course of experimental reform is the course that Washington wisely took on welfare reform in the 1990s. It is the way forward for ESEA and for education reform in general. Let states that are interested and able be laboratories for a new federal system in education. We will soon see if wide choice of schools, competition among education providers for weighted student-based funding, good and accessible information on school performance, the yield of a healthy federal education R & D enterprise, and vigorous enforcement of civil rights laws are sufficient to generate significant progress. Federal welfare reform in the 1990s was managed through a state option that bears similarities to this proposal. Note that the Obama administration plan, announced in September 2011, to use the secretarial waiver authority in ESEA to overhaul that legislation is very different from the state option we describe in that the conditions it puts in place for waivers are created by the executive branch rather than the congress and, most importantly, the conditions it imposes are not coherent and consistent with fiscal federalism and parental choice whereas the ones we recommend are.